Make sure the echinacea supplement you take passed our tests and is right for you! Some forms of Echinacea help prevent colds and cold-symptoms, but with so many different types Echinacea marketed, how do you know which one to choose? 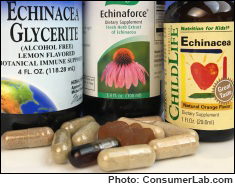 In this report, ConsumerLab.com explains which types of Echinacea have the most clinical evidence, what to look for on labels, how to use Echinacea, and, based on ConsumerLab.com's laboratory testing, which supplements are of best quality. During our testing, we discovered one Echinacea product which was contaminated with lead and two products which don't seem to provide the amounts of Echinacea expected from their labels. We also reveal that one product doesn't even disclose how much Echinacea it contains — a violation of FDA rules. Fortunately, we identified a number of quality products which provide the type and dose of Echinacea most likely to work.